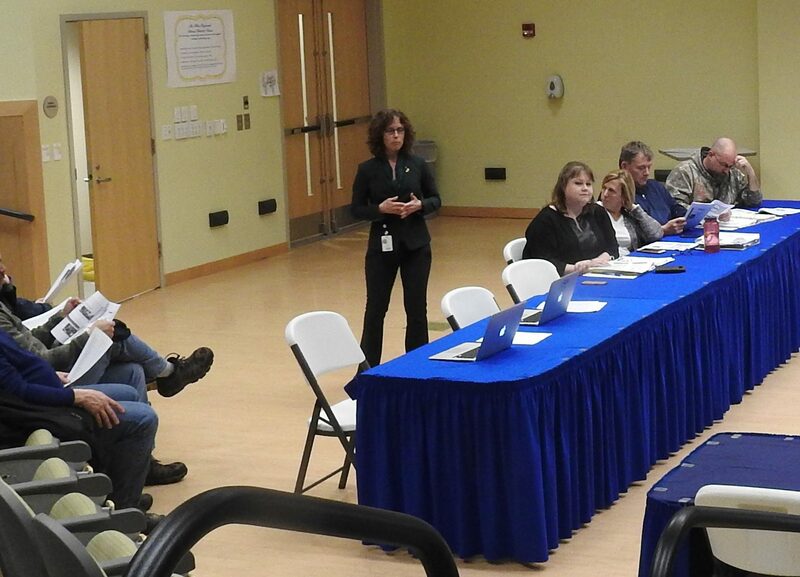 Superintendent Tina Meserve speaks about the budget. To the left are four of the budget committee members: Chair Cherieann Harrison of Wilton, Director Angela LeClair of Wilton, Director Jeff Harris of New Sharon and Director Jesse Sillanpaa of Industry. FARMINGTON - Roughly 20 or so residents, along with school board directors and administrators, braved wintry roads to hear a presentation on a proposed $37.1 million budget for Regional School Unit 9 Tuesday evening. Those in attendance were among the first to learn that there will be zero increase to health insurance costs in fiscal year 2019-20, allowing the district to back out a couple hundred thousand dollars in potential expenditures. Previously, preliminary budget figures included an increase of 8.8 percent as a placeholder. As currently presented, the budget would be $37,125,036, and increase of $1.58 million or 4.44 percent over the current fiscal year. With an additional $1.07 million in state funding for the district, the budget would result in a local tax increase of $36,050, or .27 percent over the entire district. The biggest reason for the increase to state funding is RSU 9's climbing enrollment, with an extra 59 students bringing additional funding into a district that added 118 students in the previous two years. Specifically, Chesterville would see a $8,723 increase, or .83 percent; Farmington would see a $50,102 increase, or 1.05 percent; Industry would see a $8,695 increase, or .94 percent; New Sharon would see a decrease of $3,201, or a reduction of .31 percent; New Vineyard would see an increase of $21,846, or 2.94 percent; Starks would see an increase of $17,989, or 3.88 percent; Temple would see an increase of $7,347 or 1.73 percent; Vienna would see an increase of $8,559 or 1.19 percent; Weld would see a decrease of $27,352, a reduction of 5.22 percent; and Wilton would see a decrease of $56,657, or a reduction of 2.01 percent. Historically, local assessments decreased by 2 percent in 2016-17, decreased by 2 percent again in 2017-18, increased by 6.25 percent in 2018-19 (the current fiscal year) and the proposed budget would increase the local assessment by .27 percent this year. The preliminary budget could change prior to being presented to residents at the district-wide budget meeting scheduled for May 28. One possibility may be taking a second teaching position out of Title 2 federal funding and adding it to the regular budget. Superintendent Tina Meserve has already proposed taking one teaching position out of Title 2 and adding it into the budget, with that change being already reflected in the $37.1 million bottom-line figure. Her concern is that the federal budget proposed by President Donald Trump would eliminated the Title 2 money that funds the classroom size reduction grant used by RSU 9. The president also proposed eliminating the Title 2 funding last year, but those funds were added back into the budget by Congress. Moving a second teaching position from Title 2 to the regular budget would cost roughly $60,000, although the school board could choose to reduce contingency expenditures to help compensate. That discussion could be part of the board deliberations on April 23, when the budget is scheduled to be set at the school board level. Other proposed increases presented by Meserve were similar to those discussed by the budget committee, a group of five directors that spent 20 hours developing the budget prior to its presentation to the general board last week. Increases include adding a currently-active Cape Cod Hill School teaching position to the budget, having previously funded the position out of contingency this year, a half-time social worker position at Mt. Blue High School, a two-day-a-week nurse at W.G. Mallett, increasing a secretary position at Mt. Blue Middle School to full time and a behavioral ed tech interventionist and a quarter-time social worker at Cape Cod Hill School. Some questions and comments from the audience related to the Pathway for All Learners program, as the budget includes altering the PALs program from what was previously envisioned for grades 3 to 5. The proposed change would hire a social worker and a Board Certified Behavior Analyst instead of a Special Education teacher and three ed techs; the additional cost to the district is estimated to be $15,000 to $20,000. The program would go into schools rather than pull students out of their buildings to a central location. The K-2 program, operating out of Mallett, would continue working as designed. That PALs program is working with 9 elementary students since the teacher was hired in December. Additionally, administrators said, the BCBA and social worker had been meeting with students in other schools when time allows. The high school had previously requested $53,000 to implement Building Assets, Reducing Risks, a program aimed at helping high school teachers coordinate resources for freshmen, a class that generally experiences higher suspension rates and failure rates for classes. Other districts that have used the program have reported decreases in in suspensions and failed classes within a year, including a neighboring school. As a grant has been secured to pay for the majority of the costs associated with BARR over its three-year period, that proposed increase is down to a $3,000 stipend. Two buses would be purchased if the budget were approved as presented. The combined cost to the district for both buses would be $51,000 on a $206,000 purchase thanks to the Volkswagen emissions scandal settlement, which would pay the bulk of the cost. Facility improvements would include safety upgrades such as cameras, doors, Americans with Disability Act playground equipment and traffic studies at Cascade Brook School, MBMS and MBHS with an eye toward improving traffic flow. The budget also includes 2.5 percent increases in salary for teachers and 5 percent for support staff. More information on the budget can be found here by clicking on the "Mt. Blue RSD Budget Information 2019-2020" link. This includes budget presentations and documents, as well as video from the budget meetings. Meserve also intends to add a copy of Tuesday's presentation a voice-over for people that weren't able to attend Tuesday's meeting due to weather. The projected date to set the budget recommendation at the board level would be Tuesday, April 23, with that meeting beginning at 6:30 p.m. at the high school.